“It’s very satisfying to be in a position to help others have a better life,” said Keith Swayne, founder and director of the Keith and Judy Swayne Family Foundation. Keith and his daughter, Anne Swayne Keir, accepted the 2015 Dove Award on behalf of their family’s foundation. The Dove Award is presented each year to a group of individuals who have made a significant contribution to Human Options, a nonprofit organization working to stop the cycle of domestic violence in Orange County. The award was presented at Human Options’ Serious Fun Fundraiser on May 8 at the Balboa Beach Club in Newport Beach. It was given in recognition of the financial support that the Keith and Judy Swayne Family Foundation provides Human Options and many other causes. The Dove Award also honored the memory of Keith’s wife, Judy Swayne, who passed way in November 2014. Judy served on the Human Options Board of Directors for 10 years and she was the board’s president in 1986. 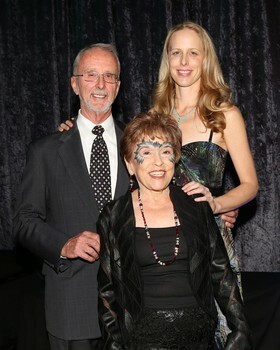 She served on numerous nonprofit boards and founded the Orange County Community Foundation. Judy was recognized as a leader in the nonprofit community and as an advocate for women’s issues. Keith and Judy formed The Keith and Judy Swayne Family Foundation in 2004 to involve younger Swayne family members in philanthropy. It was also created to address issues and needs in the community, especially those of the most vulnerable. The foundation’s mission is to influence positive outcomes by investing in efforts to strengthen families and communities in Orange County and Hawaii.